Iâ€™m no doubt dating myself, but when I was a kid, I had a popgun â€“ the old-fashioned kind with a cork and string (no fake Star Wars light saber for me). You pulled the trigger, and the cork popped out of the barrel attached to a string. If you were like me, you immediately attached a longer string to improve the popgunâ€™s reach. Why the reminiscing? Because â€œPopgunâ€ is the name of a bar pattern I would like to share with you this month. And itâ€™s the path of the cork (out and back) that made me think of the name for this pattern. So whatâ€™s so special about the Popgun? It introduces swift, tradable moves in price. More importantly, once the moves end, they are significantly retraced, just like the popgun cork going out and back. As you can see in Chart 2 [not shown], prices advance sharply following the Popgun, and then the move is significantly retraced. In Chart 3 [not shown], we see the same thing again but to the downside: prices fall dramatically after the Popgun, and then a sizable correction develops. How can we incorporate this bar pattern into our Elliott wave analysis? 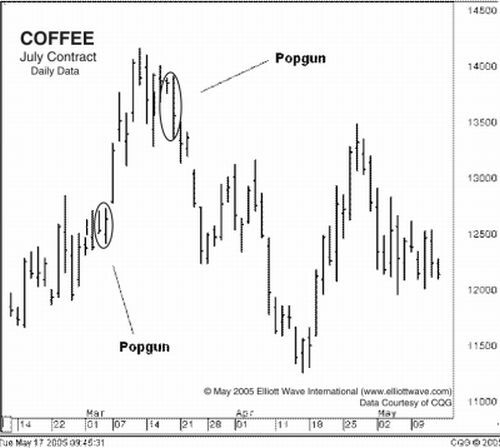 The best way is to understand where Popguns show up in the wave patterns. 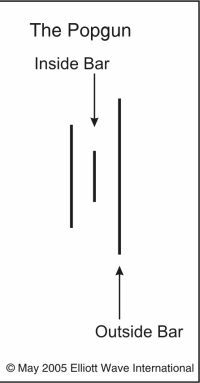 I have noticed that Popguns tend to occur prior to impulse waves â€“ waves one, three and five. But, remember, waves A and C of corrective wave patterns are also technically impulse waves. So Popguns can occur prior to those moves as well. Thereâ€™s only one more thing to know about using this Popgun trade setup: Just be careful and donâ€™t shoot your eye out, as my mom would say. In this comprehensive collection, Jeffrey provides each pattern with a definition, illustrations of its form, lessons on its application and how to incorporate it into Elliott wave analysis, historical examples of its occurrence in major commodity markets, and ultimately — compelling proof of how it identified swift and sizable moves.Best of all is, you can read the entire, 15-page report today at absolutely no cost. You read that right. The “How To Use Bar Patterns To Spot Trade Setups” is available with any free, Club EWI membership.